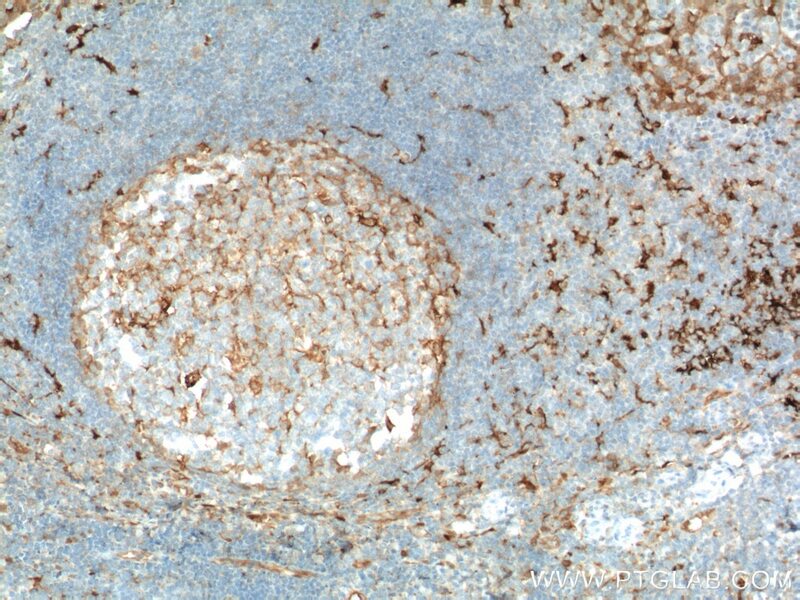 Immunohistochemical analysis of paraffin-embedded human tonsillitis tissue slide using 66321-1-Ig( Fascin Antibody) at dilution of 1:600 (under 10x lens). Heat mediated antigen retrieved with Tris-EDTA buffer(pH9). 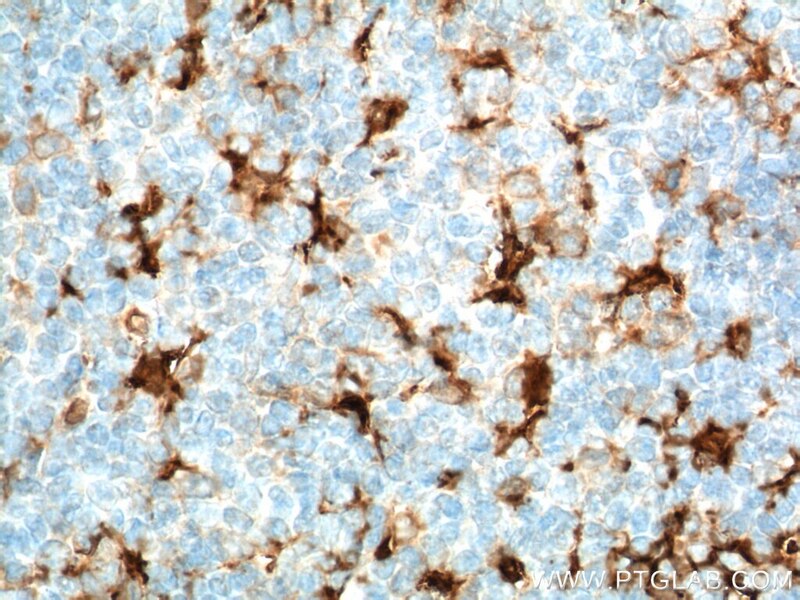 Immunohistochemical analysis of paraffin-embedded human tonsillitis tissue slide using 66321-1-Ig( Fascin Antibody) at dilution of 1:600 (under 40x lens). Heat mediated antigen retrieved with Tris-EDTA buffer(pH9). 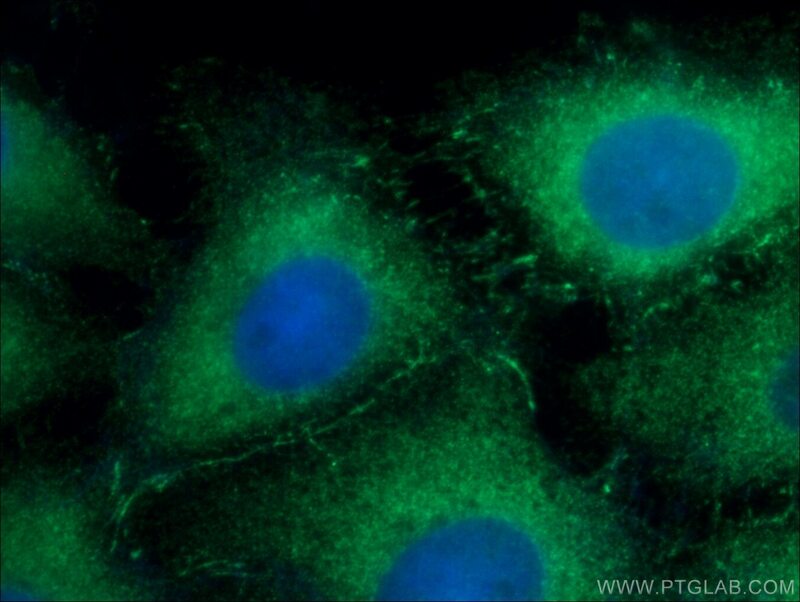 Fascin is a highly conserved and ubiquitous actin cross-linking protein that has a major function in cell motility and adhesion. Fascin localizes to a number of highly dynamic cellular structures that require strong mechanical support which include stress fibers and cellular protrusions such as microvilli, microspikes and lamellipodia. Fascin is up-regulated in many human carcinomas. It’s a marker for Reed-Sternberg cells in Hodgkin's disease; it is also a highly selective marker for dendritic cells of lymphoid tissues. 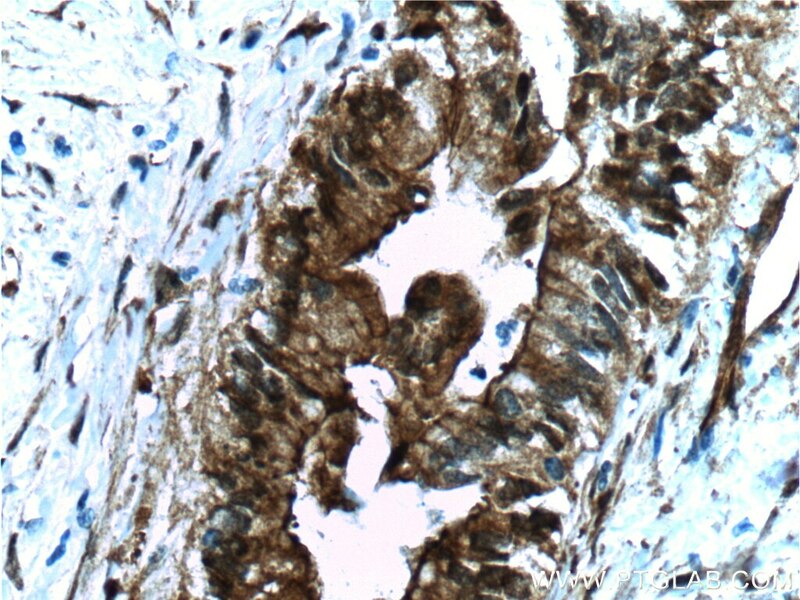 Immunohistochemical analysis of paraffin-embedded human pancreas cancer tissue slide using 66321-1-Ig( Fascin Antibody) at dilution of 1:500 (under 10x lens). heat mediated antigen retrieved with Tris-EDTA buffer(pH9). 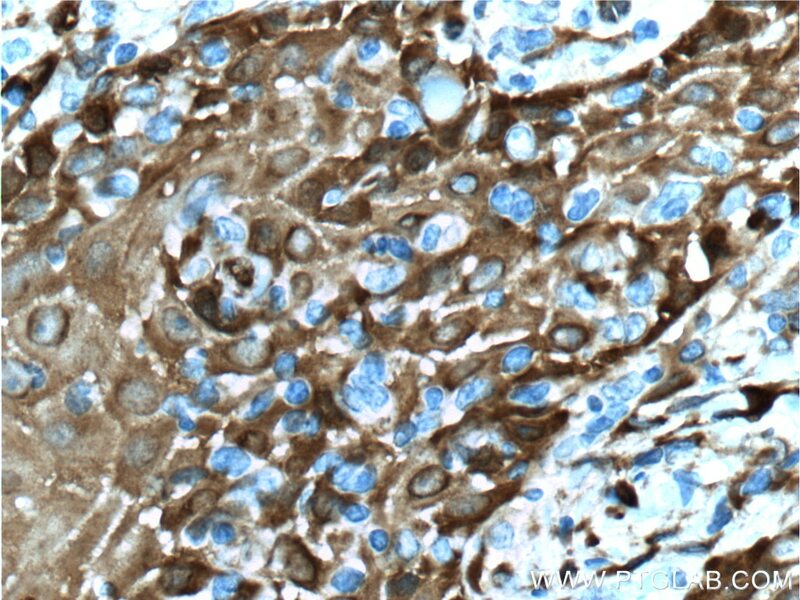 Immunohistochemical analysis of paraffin-embedded human pancreas cancer tissue slide using 66321-1-Ig( Fascin Antibody) at dilution of 1:500 (under 40x lens). heat mediated antigen retrieved with Tris-EDTA buffer(pH9). 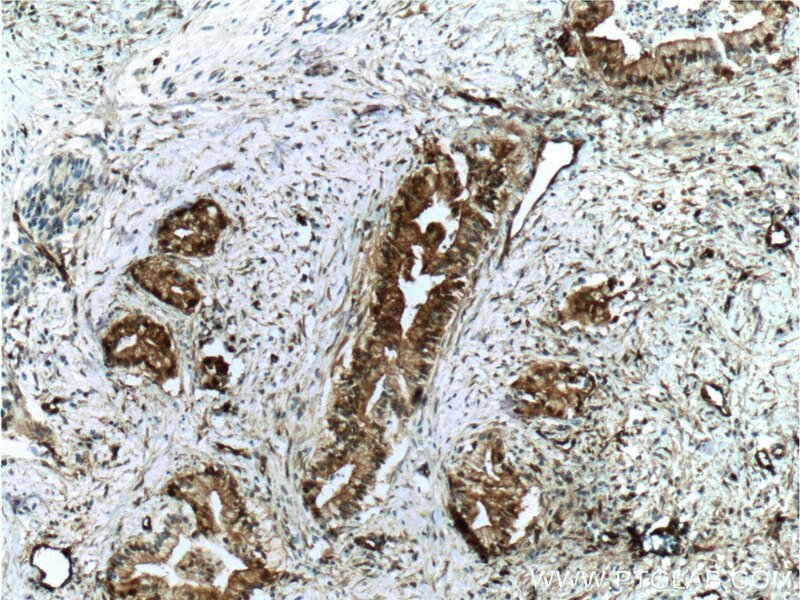 Immunohistochemical analysis of paraffin-embedded human skin cancer tissue slide using 66321-1-Ig( Fascin Antibody) at dilution of 1:500 (under 10x lens). heat mediated antigen retrieved with Tris-EDTA buffer(pH9). 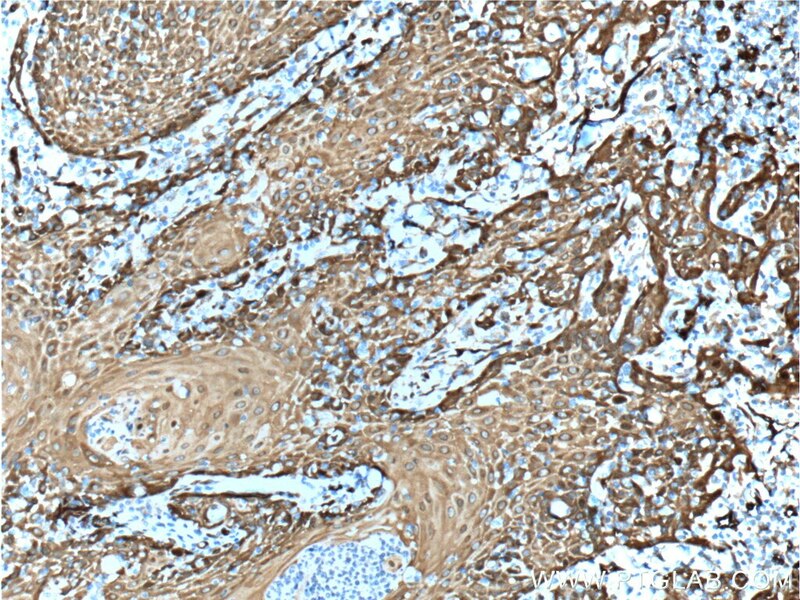 Immunohistochemical analysis of paraffin-embedded human skin cancer tissue slide using 66321-1-Ig( Fascin Antibody) at dilution of 1:500 (under 40x lens). heat mediated antigen retrieved with Tris-EDTA buffer(pH9).